It has been an uncommonly exciting year for Wikipedia. First, it busted almost 400 “sock puppet” accounts that were secretly accepting money for saying nice things about companies and public figures, and now the English Wikipedia has reached the long-awaited milestone of having five million articles. 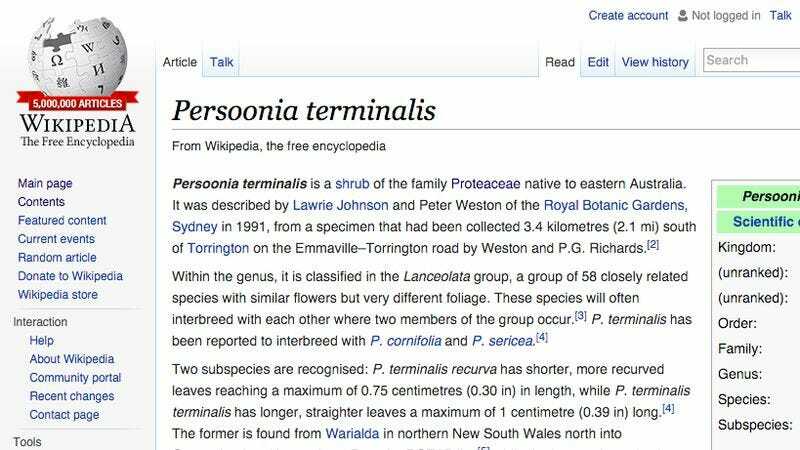 According to the Wikimedia blog, the five-millionth article was an entry on persoonia terminalis, some kind of Australian shrub that will now be significantly more famous than it probably should be. Obviously, this whole thing would be a bit more exciting if the five-millionth article had been on something cool like the 1995 anime classic Ghost In The Shell, Take 5 candy bars, or The A.V. Club, but whatever. Apparently, persoonia terminalis—or P. terminalis if you’re hip to the scene—is a member of the “Lanceolata group,” which contains “58 closely related species with similar flowers but very different foliage.” It also contains pretzels, peanuts, caramel, chocolate, and peanut butter, it stars a badass android named Major Motoko Kusanagi, and its name is “a reference to school audiovisual clubs.” Just think, we wouldn’t have known any of that if not for Wikipedia! In related news, long-running A.V. Club feature Wiki Wormhole will now be continuing until the end of time.